Billdesk, one of India’s earliest online payment gateway solution providers, has reported a revenue of INR 520 Crores in FY15-16 with a PAT of INR 76 Crores. Billdesk is one of the popular payment gateways used by online merchants and you must have spotted the name while making a payment online. 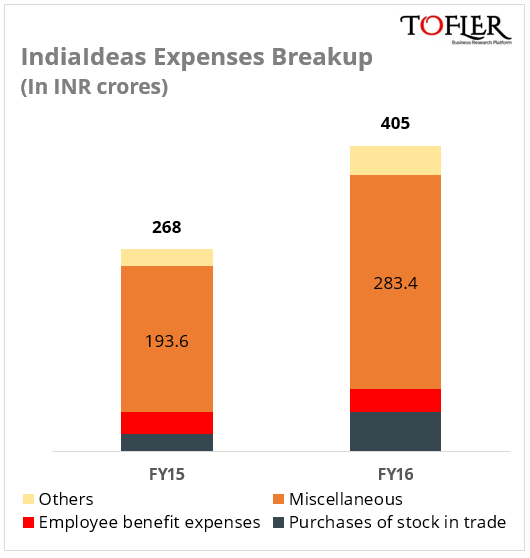 INDIAIDEAS COM LIMITED, which owns and operates Billdesk, reported its 2015-2016 financial result, and its annual revenue at INR 520.2 Crores, is the highest in the company’s history. The company has reported a 40% growth in its revenue for the FY ended 31 Mar 2016 from INR 372 Crores in the previous FY. It registered a Net Profit of Rs. 76 crores with a net margin of 14.6%. Its 5-year revenue CAGR is an impressive 27%. About 10% of the company’s revenue was contributed by the sale of products which primarily are subscription vouchers and top up products for a DTH service provider. Sale of services contributed about 85% of its revenue and primarily includes ‘Electronic Transaction Processing Services’ and ‘Automated Teller Machine Service Contract’. The Directors’ Report states that roughly 95% of the company’s turnover is attributed to its main product/service, ie. “Information technology and related services for Electronic Payments management”. However, the breakup of YoY expenditure puts about 70% of total expenditure as uncategorized ‘miscellaneous’ expenditure, leaving a lot of questions unanswered. The company had been in news over its fourth round of funding in 2015. At a valuation of $1 Billion, it had raised about $200 million in investment from General Atlantic, a global PE firm. This was reflected in their latest annual filing where the share of individual promoters dropped from 46% in 2015 to less than 35% in 2016. 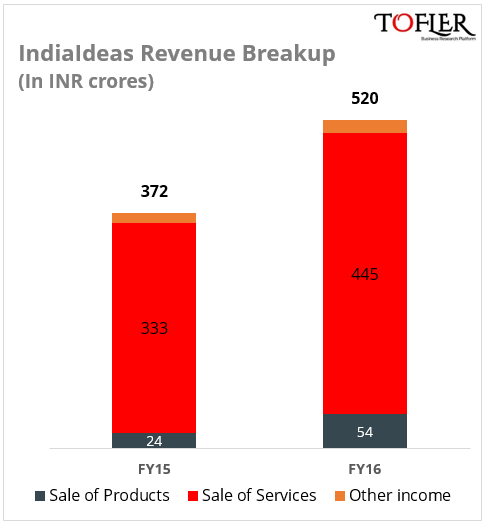 INDIAIDEAS COM LIMITED is an unlisted public company. It operates under its flagship brand BillDesk. It was incorporated on 29 March, 2000 by a team of ex-Arthur Andersen professionals. The company primarily engages in providing electronic transaction processing services to a number of leading banks like SBI, ICICI etc. ; telecom operators, like Bharti Airtel, Vodafone India, BSNL etc. ; online payment for utilities like water and gas etc. It additionally provides ATM service contracts and certain back office services. Other than that, it also sells products like Subscription vouchers and Top up Products for DTH providers like Tata Sky. The company has a subsidiary (85% holding) LOYLTY REWARDZ MANAGEMENT PRIVATE LIMITED which offers loyalty management solutions. This company reported a revenue of INR 68 Crores in FY15-16 with a Net Loss of INR 17.5 Crores. Billdesk was estimated to have ~70% of the online billing market in India back in 2015. It competes with other billing aggregators like Citrus Payment Solutions, CCAvenue etc. However, with the advent of Payment Banks, BBPOU and UPI amidst the demonetization frenzy, which is yet to settle, Billdesk will be a company to be closely watched. It will be interesting to see how it adapts to the rapidly emerging landscape of payments in India. Explore this company in detail in Tofler+. Get access to all RoC documents, financials, shareholder returns, funding rounds, management details, bank loans, litigation, credit ratings, defaulter lists, group structure and more. FAQs on Tofler+.